Golden Gables Inn Located in The Heart of Mount Washington Valley. Welcome to the White Mountains. 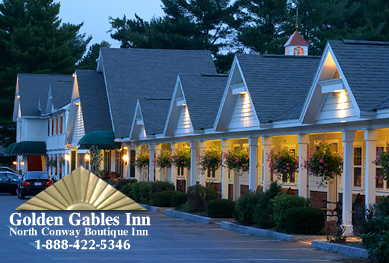 North Conway lodging at the Golden Gables Inn, a luxury motel right in the heart of Mt. Washington Valley. Family Friendly,with a beautiful pool looking out over the mountains. The Golden Gables Inn's immaculate grounds offer an outdoors pool, mountain views, and is the perfect location for skiing, hiking, shopping and more.The perfect family or couple getaway. Our premium lodging suites feature Jacuzzis, fireplaces, private decks, mountain views and excellent amenities – all in the same perfectly convenient location. For more information or to book one of our new rooms please give us a call, Or Email us.